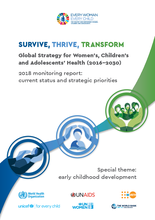 UNAIDS - "The report sets out the status of women’s, children’s and adolescents’ health, and on health systems and social and environmental determinants. Regional dashboards on 16 key indicators highlight where progress is being made or lagging. There is progress overall, but not at the level required to achieve the 2030 goals.